Settlement in Macedonia, on the Ægean Sea opposite the island of Thasos. It is nine miles southwest of Old Kavala, the ancient Neapolis. Kavala has 4,000 inhabitants, one-fourth of whom are Jews, originally from Salonica and Serres. The community was founded in 1860. It possesses a Jewish school attended by forty boys; a synagogue, erected in 1883; and a benevolent society, Ahawat ha-Ger. The Jews of Kavala are engaged mostly in the manufacture of tobacco products, the work being done only during the summer. The industry is fostered and subsidized by Jewish firms in Salonica. 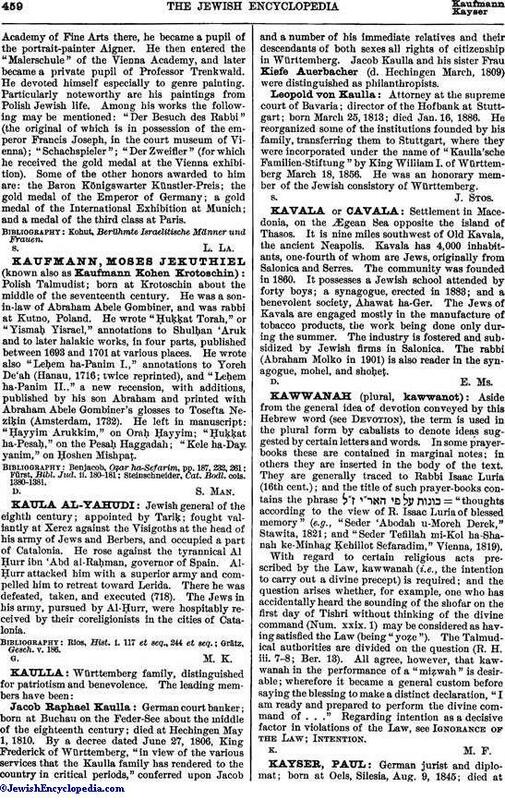 The rabbi (Abraham Molko in 1901) is also reader in the synagogue, mohel, and shoḥeṭ.